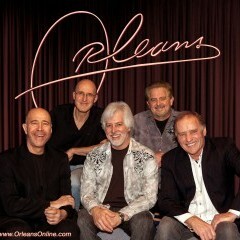 Orleans is best known as the 70s Pop/Rock band that brought you the iconic hits “Still the One”, “Dance With Me” and “Love Takes Time”. Now entering it’s 41st year of live performances, Orleans has produced a body of work spanning 16 albums and several DVDs. The band continues to be in great demand domestically and internationally for live shows, as they have been for four decades. In the summer of 2012, Orleans experienced a tragedy in the sudden passing of co- founder Larry Hoppen. While there is no replacing Larry, the decision was made to somehow continue to perform the remaining shows of the year’s calendar. Co- founder/brother Lance Hoppen, along with long-standing members Lane Hoppen, Fly Amero and Charlie Morgan were rejoined by co-founder John Hall (who had been on sabbatical as a US Congressman) in order to finish with dignity and integrity what had been started 40 years prior. With more than a dozen successful shows under their belt, the band finds that they are more than ready, willing and able to forge ahead into year 41.